Low temperatures here at house continue to slowly moderate - low this Thanksgiving Holiday came in at 28 F.
The operational GFS continues to forecast some light rain for southern Arizona at the start of Dec - above is forecast of total precipitation through the next 8 days. However, the ECMWF has trended to a dry start for next month. Looks like November will close out with a big goose egg for rain here at the house - not even a day with a Trace. Gould's turkey in free flight above. Wishing all a great Holiday and condolences to the increasing numbers of folks who have to work today. First a note about low temperatures this morning - low here at house was 24 F, while low at TUS was 35 F. The cold station out in the San Pedro Riparian Area came in at 19 F this morning. Art Douglas sent the above forecast this morning which is from the CFSv2 model that is run at the CPC. The forecast is for TUS and indicates a very wet winter, were it to verify. The graphic is hard to read here, but the accumulated precipitation forecast at the airport reaches 12 inches by the end of February! First, the morning low (am on November 25th) here, near the Rillito Wash, was 23 F. This makes 7 of last 8 mornings having temperatures here down in the 20s (other morning came in at 30 F). Plot below of morning low temperatures for the 25th, from MesoWest, is centered on the San Pedro Riparian Area - where lows have been very cold the last two mornings (9 F yesterday at station east of Tombstone and 11 F this morning). Here’s a plot (above) of yesterday’s low at my research site along the San Pedro River. This mesquite bosque site is quite close, 5 km south, of the Fairbank station shown on your Mesonet. 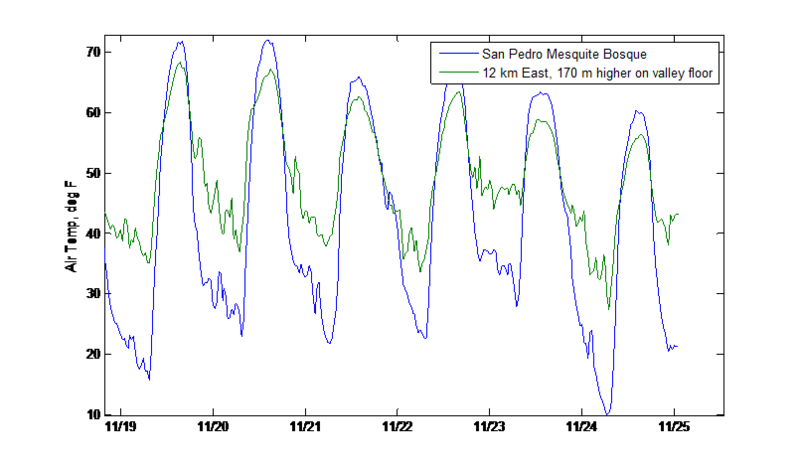 The San Pedro temp in the plot below is actually measured at 8 m height, at mid-canopy position, so a temp measurement at the standard screen height would be even colder than this. The second plot (below) shows how effective these hard freezes, which started more than a week ago, are on damping latent heat (water vapor) fluxes by putting an end to the mesquite transpiration for the year. Because it is so cold at these bottom land locations, the mesquite here don’t leaf out till late-April and don’t start transpiring until mid- May. 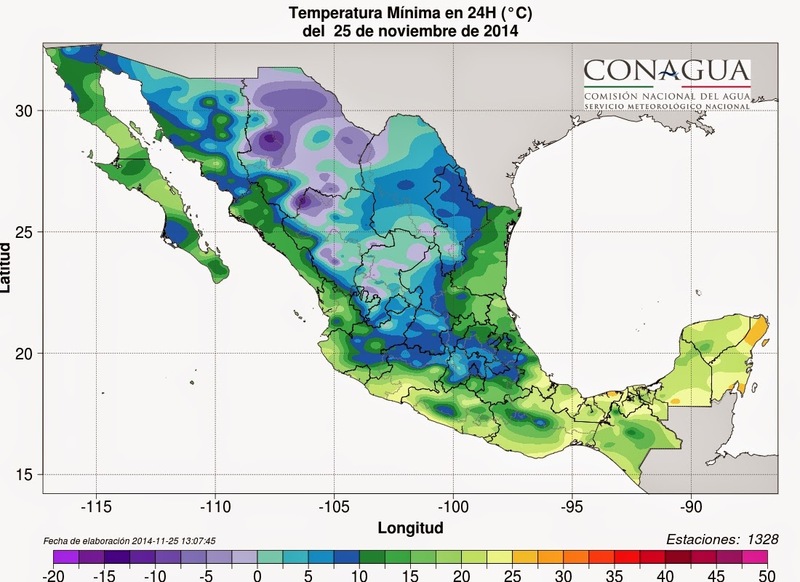 Art Douglas noted: "El Ninos frequently bring early cold and we are sure doing that this year in some parts of the SW. Attached is this morning's low temp map for Mexico (below)." That 10 degree F observation along the San Pedro (at Fairbank) would not at all surprise me. I have a flux tower a few miles south of that site also right along the San Pedro and on a night like last night it is 15 to 20 degrees colder along the river than outside the riparian bottomland. I'll be able to check that when the data comes in tonight. I have posted a plot of minimum temperatures observed during the past 24-hours at MesoWest stations across southeast Arizona. Russ' comments are about the station in the San Pedro Riparian area that shows a min temperature of 9 F this morning. This is certainly a really cold spot if the observation holds up. There were quite a few freezing and below temperatures across the colder parts of the metro area this morning (the blue shades). Coldest morning of year so far this Fall here on north side of Tucson along the Rillito Wash. Low temperature here at house fell to 21 F, making the morning 4 F colder than the lows on the 17th and 18th. There is a light touch of frost on roofs, cars, and trash bins, even though dewpoints are very low. Quick look at early WRF indicates that the model forecasts this to be the coldest morning, with temperatures up a bit tomorrow because of easterly winds. That will probably be tough to call, since some low spots may go calm, with colder temperatures than model forecast. The two plots are from MesoWest and show plots of surface conditions at about 7:30 am MST. Above is broad view and below is zoomed on Tucson metro. Many temperatures around in the 20s, with some teens over toward Benson. One station was reporting 10 F, but that looks suspicious. Hear, hear. This has been not just a pet peeve of mine, but a problem in operational meteorology, for a long time. "Energy" has no meaning. The similarly used "dynamics" doesn't either. The chart being showed presumably involves vorticity. If "vorticity" is too big a word for the public--and I understand that--then don't show that chart to begin with. 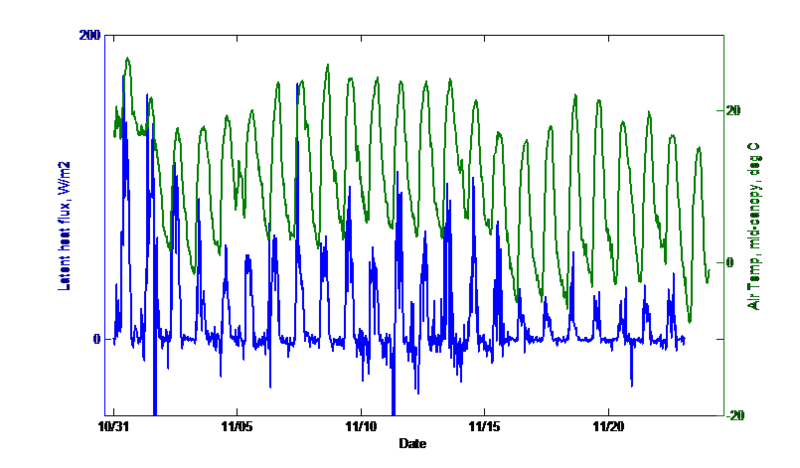 Instead show something else, such as temperature or wind, that is more conceptually comprehensible and isn't perceived as dense meteorological jargon. BAD WORDING: “Energy” in the context of perturbations or the instability they may cause, such as upper-level energy approaching. REASONING: Same as with “dynamics”, but worse. Energy, in many forms, is everywhere in the atmosphere! As such, this word is meaningless. BETTER ALTERNATIVE(S): As with “dynamics”, this depends on the specific situation. Just state the actual feature or process involved. A more-informed reader is…a more-informed reader! I took a look at some more FDs yesterday afternoon and found several discussions throwing around the "energy" term. Interestingly, I found an FD from Boulder/Denver that used the term "moisture wave," as well as "energy." However, they will find no entry for "energy" since there are many types (e.g., nuclear energy, kinetic energy, etc.). One can find an entry in the glossary for "kinetic energy" and might possibly assume that this is what is shown on this graphic. But, no - the text on this graphic is just a sloppy use of technical jargon that has no exact meaning. The chart is actually the NAM analysis of 500 mb winds, heights and vorticity (and as indicated on the graphic it is actually an analysis of geostrophic absolute vorticity). The NAM analysis is shown below. The NWS NAM display can also be criticized for incomplete legends - i.e., bar graphic at left has omitted the power of 10 portion of the magnitude and the units. But, it is a professional chart that is far better than the local chart with its erroneous terminology. Edited to add graphic of SLC NWS radar at game time. Arizona and Utah meet this afternoon (at Utah) in an important football game for both teams. Weather looks like it will provide a serious challenge for both the teams and the fans, as a cold front and precipitation are approaching northern Utah. Current NWS forecast for a grid near the University is shown above - wind, rain, and then wet snow for the game. I took a look at the early WRF-NAM (forecast on 5.4 km grid, initialized at midnight last night) and the forecast above shows radar echoes forecast for 2 PM MST today - near start time of the game. Definitely wet and cold and possibly turning white by the time the game ends. Forecast below shows accumulated precipitation for period ending at 5 pm. I see that this morning's line is Utah by 4 1/2 and wonder if the line considered the forecast for a sloppy situation? As for yesterday's short-wave here in southeastern Arizona - the system brought little in the way of showers for most of eastern Pima County. 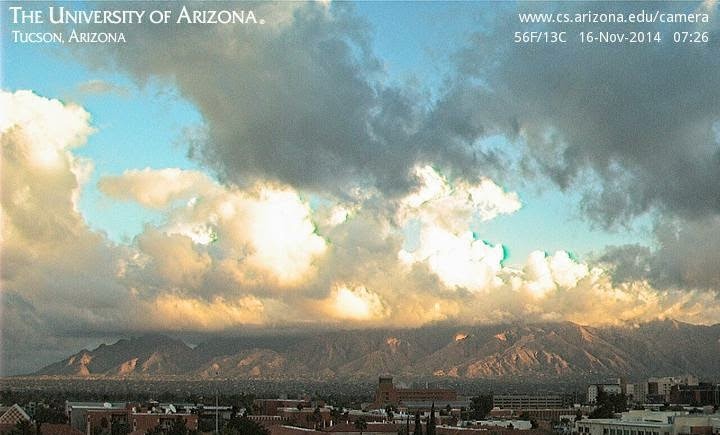 But, there were showers and thunderstorms to the south and southwest of Tucson during the evening. Rain was measured at 6 of the 92 ALERT sites over the far southwest part of the network. The plot of detected CGs above is for period ending at midnight last night and indicates thunderstorms along the border and in northern Sonora, as the wave passed by. Noticed two examples of numerical model flip-flops this morning for consecutive runs of both the WRF-NAM (short term forecast) and the ECMWF (long term global forecast). First the WRF-NAM forecasts for this afternoon (Friday, November 21st). Above graphic shows accumulated precipitation through midnight tonight from the forecast run initialized at 12 UTC yesterday morning - with the model squeezing out a precipitation event for eastern Pima County as a moisture-starved short wave passes by. However, the current early run of same model (below), initialized at midnight this morning, forecasts only a bit of rain by midnight tonight over the far southeast corner of the state. The changes in the forecasts reflect changes within the NWS NAM forecasts, since the high resolution WRF is driven by the lower resolution NAM model. Current forecasts for this afternoon, if they verify, indicate an unsettled situation with fits of wind, virga, mammatus, and some sprinkles around eastern Pima County. At the global scale, the ECMWF has been forecasting a nasty winter storm along the Front Range of the Rockies for Thanksgiving day. The two panels shown above are from the ECMWF forecasts initialized at 12 UTC yesterday morning (500 mb at left and surface with 1000-500 mb thickness at right). The forecast is valid at 5 am MST on Thanksgiving day, and indicates strong, cold upslope flow and a nasty snow storm from Wyoming down to northern New Mexico. However, the forecast that was initialized at 00 UTC last evening (below, same panels valid at 5 pm on Thanksgiving day). Has a completely different forecast (this flip-flop taking the ECMWF into sync with the GFS forecasts of past few days). So the current forecast from the ECMWF would bring a mild Thanksgiving day for the Front Range with some downslope, Chinook winds. This is one of the largest run-to-run flip-flops by the ECMWF that I can recall. So many uncertainties still exist in weather forecasting for some situations - both for short and long terms. Another cold morning here along the Rillito Wash with a low temperature of 28 F at the house. Above is this morning's NAM analysis for 500 mb. The short wave and vorticity maximum west of Oregon and northern California is forecast by the model to dig southeastward and cross Arizona tomorrow and Saturday. The 500 mb forecast below is valid at 12 UTC on Saturday morning. This system is moisture starved, but models forecast some light showers across parts of southern Arizona tomorrow into Saturday morning. Above is current NAM forecast of precipitation through noon on Saturday, while the early WRF-NAM from midnight forecasts some amounts of a quarter inch and bit more over in Cochise County. WRF forecast of rainfall below is also valid through noon on Saturday. 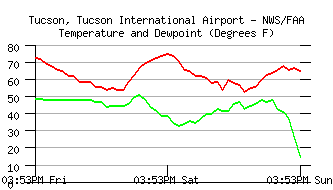 Here in Tucson, something went awry in the airport temperature data - note that the 24-hour minimum temperature for the 18th is indicated above as 10 F - that would have been quite some record for here. 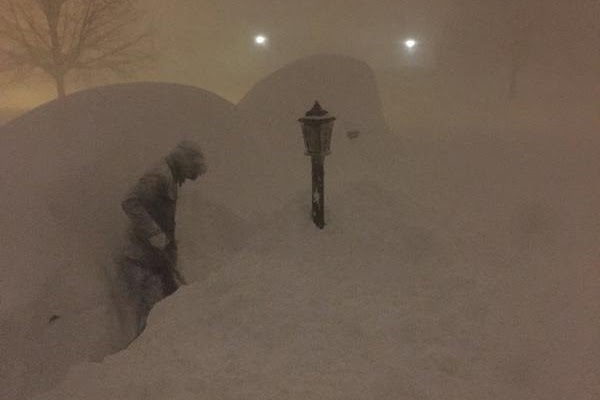 Far to the east, along Lake Erie, tremendously heavy, lake-effect snows buried parts of Buffalo and environs with as much as 6+ ft of snow. Photo during the event below (un-credited) conveys the unbelievable character of this event. The low here at house this morning (Tuesday, November 18th) was again 25 F. There was a light frost on the grass area down at the Natural Resources Park, sparkling brightly as the sun rose. The viewing was quite good early this morning, as there were only some patches of thin cirrus scooting by. I sat, bundled up, out in the courtyard for over half an hour, but the Leonids were a no show, while I was out watching. So it goes. It was very cold here in north Tucson along the Rillito Wash at sunrise this morning. Wore winter gear on my walk and was still a bit cold. Low temperature here at house fell to 25 F vs 36 or 37 F at the balmy NWS airport ASOS location. Other spots with readings in the 20s include the Sasabe RAWS site with a low of 25 F and the Empire RAWS site with a low of 24 F. In contrast, the low at the high-elevation, Mt. Hopkins RAWS station was only 38 F.
The Leonid meteor shower occurs tonight, with maximum activity expected after midnight. The early WRF-NAM forecast (above) of OLR indicates a forecast of mostly clear skies valid at 3 am MST. The WRF-GFS forecast is similar with only a bit of thicker cirrus out to the west. The outlook for the shower itself is that it will be a weak display this year. 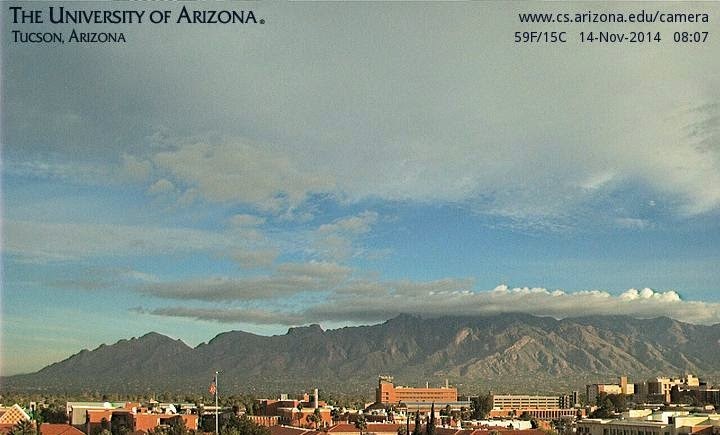 View of Catalinas (above) shows moderate Cu over the mountains at 7:30 am MST this morning (Sunday, November 16th). The MesoWest surface plot (below) is for 4:30 pm and indicates that the cold front has now crossed most of the state. The gusty winds (gusts are in red) were much as forecast by the WRF-NAM yesterday. Saw gusts over 40 mph earlier today at Yuma, and there were reports of blowing dust in Yuma and Phoenix areas. 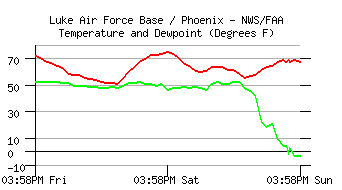 Time-series of the surface observations for Luke AFB (above) and TUS (below) show that dewpoints have plummeted with the passage of the cold front. Luke Td is below 0 F and TUS has fallen into the teens. Places where the winds set will be very cold (for southern Arizona) the next two mornings. If the winds go calm here along the Rillito, I expect we'll see temperatures into the 20s. Low here at house ahead of the front this morning was a chilly 38 F.
Chaotic skies this morning with a mixture of high clouds and low clouds hanging on the high mountain tops. 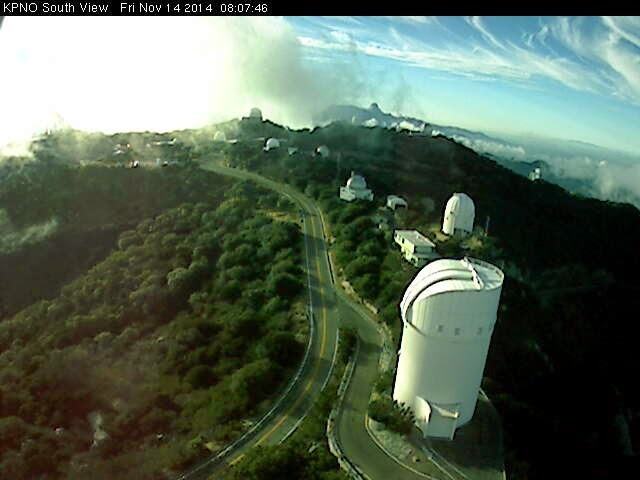 Views here, from just after 8:00 am MST, are of Catalinas from campus (above) and from Kitt Peak looking south (below). As a strong, short wave crosses northern Arizona on Sunday, cold air will invade the state from the Great Basin. The early WRF-NAM forecasts for 10-m winds on Sunday afternoon (November 16th) are shown above for 3:00 pm MST and below for 6:00 pm. The cold air brings quite strong winds out along the lower Colorado River area first on Sunday and then spreads across Maricopa County, with strong winds forecast for the Phoenix metro area by evening Sunday. It appears that freezing temperatures will return here along the Rillito in north Tucson early next week, bringing the second round of 32 F, or colder, morning lows for this Fall. Very cold arctic air, particularly for early November, has plunged southward over the Plains, parts of the Northwest, and along the Front Range. 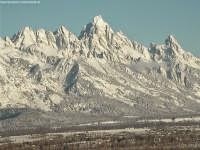 View above (from Jack Hales weather site - link to right) shows the Tetons this morning. While surface plot below, centered on Denver, shows some of the cold temperatures this morning. Both graphics are from a bit before 8:30 am MST this morning, November 12th. First - a bit on recent minimum temperatures. Low here yesterday morning was 45 F and there was a light breeze blowing. But, down right along the Rillito only the tops of tallest trees were indicating wind, and it was calm and much cooler along the wash This morning it was calm both here at the house and down along the wash. Low at house was 37 F and it was markedly colder down along the wash - so much so that I wished I'd worn gloves. Yesterday evening we drove out to Santa Rita Abbey (~ 5 miles north-northwest of the highways 82/83 intersection in Sonoita). I had noticed several years after the NWS started doing grid point, deterministic forecasts that the forecast low for the Abbey location was routinely too warm. Often times when we arrived out there just after dark, the temperature (from car's outside air thermometer reading) was often already colder than the forecast low for the next morning. So out of curiosity, re were the grid point forecasts improved now, I checked the forecast yesterday for the Abbey grid - it was for a low of 47 F. When we arrived up there (about 10 after 8:00 pm MST) the indicated outside air temperature was already down to 39 F - so things yesterday remained similar to a number of years ago. I also checked the grid point forecast for this morning's low at the Mt. Hopkins RAWS site: 46 F versus an observed low of 55 F. An east wind continued through the night there. It was calm at the Abbey, while a bit to the north-northeast at the Empire RAWS site the low was 38 F, with a light westerly drainage wind through the night. Point of all this is that the conditions related to observed low temperatures in this area are very much locally dependent upon wind, elevation and nearby land surface conditions (assuming clear skies, low humidity, and light winds at the larger scales). All of this long-winded post was triggered by an NWS forecast discussion the other day that mentioned: THE WINDS MAY STAY UP IN SOME VALLEYS OVERNIGHT...BUT AT THE VERY LEAST WINDS OVER THE HIGH TERRAIN WILL NOT ALLOW NORMAL DRAINAGE OF COOLER AIR INTO THE VALLEYS. 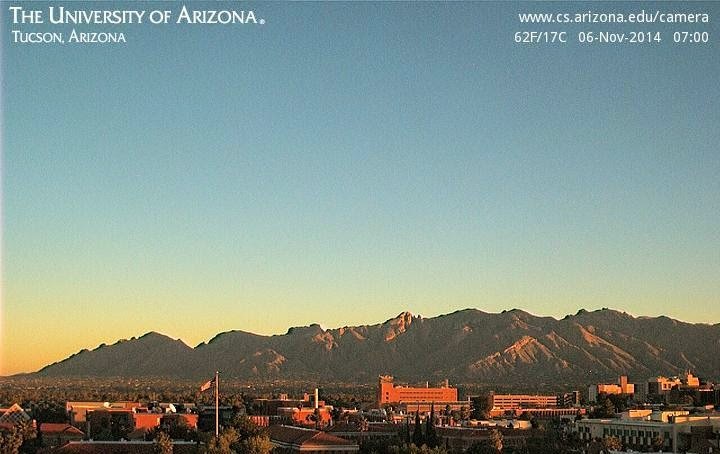 This leads, of course, to the question: What is the "normal" drainage flow of cooler air into the valleys around Tucson? I feel that the answers to this question are not well documented or known. For example, the nighttime winds at the airport, under weak synoptic regimes, tend to be from the southeast. But what is not clear is at/from what elevations do these winds originate (for example, last night they certainly were not originating over the high terrain of the Santa Rita Mountains, where the potential temperature remained much warmer than those at the airport). When I first moved here, I was puzzled by the obvious differences between drainage winds off the south faces of the Catalina Mountains versus those I had observed along the Colorado Front Range. Here at the house there seemed to be no drainage wind on nights with clear skies and light winds coming off the Catalinas; whereas, places I had experience with in Colorado had distinct drainage wind patterns from nearby high terrain into lower elevations. The foothills to the north of the Rillito wash are known locally to be a warm zone relative to lower elevations to the south. It was after a trip up to Summerhaven on Mt. Lemmon that the differences between here and mountains at higher latitudes began to sink in. I'll illustrate with some images snipped from Google. The image above shows Pike's Peak and Colorado Springs, Colorado. The higher elevations west of Colorado Springs are dominated by rocks and barren terrain, above the tree line. The difference in elevation from the peak (14,114 ft MSL) to the airport (6,187 ft and ~19 miles from the peak at the southeast corner of image) is 7,927 ft. In contrast, image below shows the Catalinas and Mt. Lemmon (9,159 ft MSL). Note that there is no high elevation tree line and that the Sky Island is covered by dense forest from lower elevations to the summits. The difference between the elevation of Mt. Lemmon and here at the house is 6,790 ft and the distance is about 14 miles. Thus, the elevation changes from the west side of Colorado Springs up to Pike's Peak and from here to Mt. Lemmon are fairly similar. The important difference is that the radiative surface characters are very much different (at least under clear, dry, quiescent conditions). Cooler air that develops during the night at high elevations of the Catalinas can not drain very far down the slopes before compressional warming puts on the brakes. So, no routine cooling winds during the night/early morning here at house during the heat of May and June, at least not from the Catalinas to the north. Above is an image showing the location of our house and nearby areas. There is some green apparent up in the foothills "banana belt". But a vast area to our east, along washes and toward Redington Pass, is very barren terrain that radiates very effectively. So my feeling is that the very cold temperatures observed along the Rillito develop in situ and over the barren terrain along the north and east slopes of the nearby washes. The image below emphasizes this by showing the area along and north of the Rillito wash within a few miles of the house. Probably the only way to study the local drainage regimes (say off the entire Catlinas Sky Island) would be to utilize a very-high resolution numerical model - one that could capture the terrain and surface character down at resolutions below 500 m.
Very nice lighting highlights just after sunrise this morning - above image from 7:00 am MST. As I walked I could see rotor clouds just downwind of Mt. Hopkins to the south. So I checked the RAWS site observations down there and found that the max gusts during last 24-hours was 88 mph, just a bit after midnight early this morning. This is the highest gust speed at Mt. Hopkins that I can recall. The exposed location of this RAWS station is downwind and just slightly south of Mt. Wrightson during easterly winds. Apparently a standing wave from Wrightson surfaces at Hopkins sometimes. In the longer term, the ECMWF forecasts a very significant plunge of arctic air into much of the U.S. early next week. The surface forecast below is valid at 00 UTC on November 12th. Although the cold front has reached nearly to the Gulf of Mexico at this forecast time, the center of the high pressure is still up in Canada with SLPs of a bit over 1048 mb. I am sure that the media will be dusting off their "polar vortex" hype from last winter as this event unfolds. Morning low temperature here at house this morning dropped to 41 F sometime before the winds kicked in, up 11 F from yesterday's low. At longer ranges the ECMWF prevailed again, forecasting the current 500 mb closed low (analysis above for 12 UTC this morning) over Sonora much better than did the GFS. However this feature ended up a bit too far south to pull moisture from Vance back into southeast Arizona. Moisture from Vance, combined with slow-moving cold front in Texas, is bringing heavy rains to much of the state this morning, as per the surface plot below from 1345 UTC. Finally, the early run of the WRF-NAM keeps fairly gusty east winds blowing across southeast Arizona through morning tomorrow. Bottom is 10-m wind forecast valid at 9 am MST tomorrow morning. I was busy with other things yesterday and did not pay enough attention to the weather, not even look at the WRF forecasts. So, a surprise this morning when I went out for the newspaper - gusty east winds, wind chimes making noise, and much milder temperatures. The above plot from MesoWest shows temperatures, winds, and gusts (red) at 5:45 am MST this morning. Quite a change from yesterday's near to below freezing temperatures. There are quite a few stations reporting gusts of 30 to 40 mph - Mt. Hopkins RAWS site with gusts to 47 mph, above, has hit 56 mph during past couple of hours. The 12 UTC WRF-NAM had forecast the winds fairly accurately - forecast below for 10-m winds at 8:00 am this morning. The model-based temperature forecasts had a low of only 60 F for TUS this morning - a bit overdone, but very good on the 24-hour trend at the airport. Can't take your eye off the ball in the weather world! Just a quick update - morning low temperatures did fall to freezing and below here in the north side of the City of Tucson, along the Rillito. The low at the house was 30 F, bringing out my winter hat for the morning walk. Yesterday the low ended up at 35 F, falling two degrees after I had read it prematurely. Quite a few lows in the 20s along the San Pedro and Empire RAWS station was at 29 F - coldest I noted was again at the Columbine RAWS on Mt. Graham with a cold 18 F.
Lowest temperatures here this morning for the Fall so far. Low at house was 37 F and I could see my breath while walking - first time for that in many months. I am having some challenges with my low temperature readings and I'll discuss that in a later post. Temperatures in the valleys fell to low 30s F this morning and I see that Empire RAWS site hit 32 F. Coldest lows were at the high elevations this morning with the RAWS sites at Rincon and Sollers (Mt. Lemmon) dropping to 29 and 30 F respectively. Coldest I saw was 22 F at the Columbine site on Mt. Graham. Still expect that temperatures will fall to freezing or below here in the north part of Tucson, along the Rillito tomorrow morning. Yesterday the afternoon showers stayed mostly to the east of Tucson metro as forecast quite well by the early WRF-NAM. Rain fell at the highest elevations of the ALERT network and at the east edge, with 6 sites recording rainfall. The low elevation Tucson forecast zone remained essentially rain free yesterday. The plot of CG flashes above is for 24-hours ending at 11:00 pm MST last night. Some thunderstorm activity developed over the Rincons and Santa Ritas, but with most storm activity to the east in Cochise County. 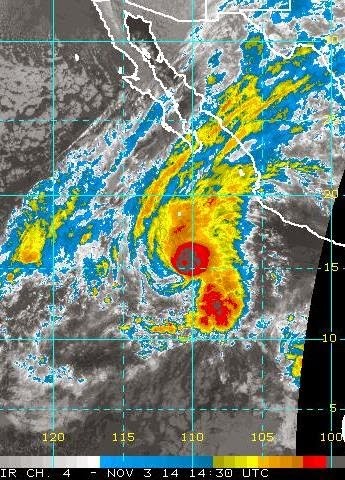 Vance is now a Category 2 hurricane and is moving northward. The IR image below is from 1430 UTC this morning and indicates significant cold cloud areas north-to-northeast and southeast of the storm's center. The NHC forecast has changed little since yesterday, with moisture from Vance to have most impact over north-central Mexico and parts of Texas. The ECMWF has been bouncing all over the place and current versions continue to form a 500 mb closed low over Mexico, but that feature is now further south and east than in yesterday's forecast, and Arizona remains mostly under the influence of the ridging behind the short wave.